Araras Ecolodge is located in the northern sector of the Pantanal, the primary wildlife sanctuary on the South American continent. Situated in an environment of mixed habitats and rare biodiversity, the lodge was built in harmony with its surroundings and is accessible via the Transpantaneira park road, 83 miles south of Cuiabá, the capital of the Brazilian state of Mato Grosso. Regional rustic style defines the lodge accommodations, and a simple, homey atmosphere prevails in its 19 guest rooms and shared spaces. Rooms have air conditioning with screened windows, ceiling fans and private bathrooms with cold and hot shower. Meals are served in the dining room or on the covered outdoor terrace adjacent to the swimming pool. The bar offers refreshing drinks, and hammocks invite relaxing on the large tiled veranda. Indoors, guests will find a reading room, gift shop and conference room for naturalist presentations. Food at Araras is a highlight, with delicious regional cuisine featuring locally raised meat and fresh fish from Pantanal waters, as well as organic salads, vegetables, seasonal fruits and fresh juices. 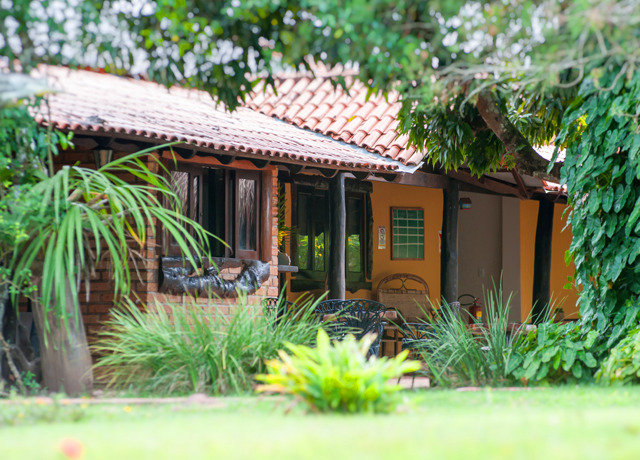 Activities around the lodge include Jeep photo safaris, nature trails that offer close-up views of Pantanal flora and fauna, and canoe excursions along placid channels.